Above: Police at the scene of a crash involving a car and a pedestrian – in the block where a yellow shoe display marks a university pedestrian and bike safety campaign. Alan McNair watched yesterday as an officer in a “Crash Team” jacket circled around a car that Baltimore police said had just struck a pedestrian at the corner of Charles and 33rd streets. McNair, an area restaurant kitchen worker, said he was not surprised that the accident occurred at that busy spot, basically Johns Hopkins University’s front door. In plain view of the crash team was evidence that Hopkins is well aware of the problem McNair described. 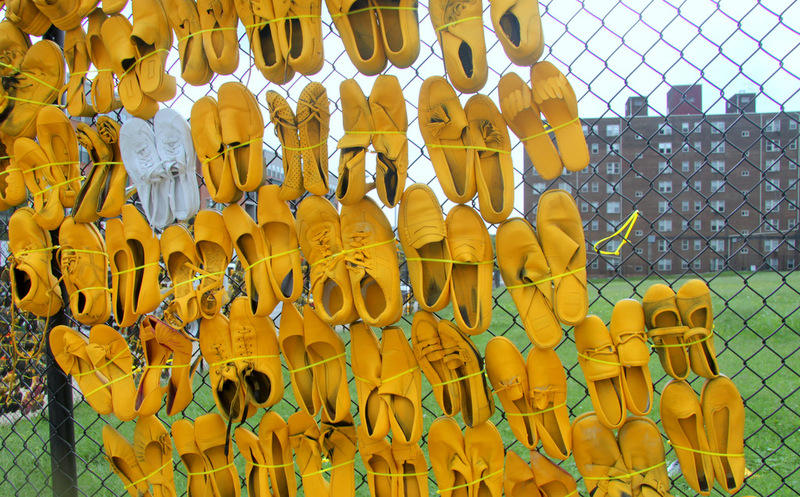 At the other end of the block, at the corner of St. Paul and 33rd streets, the school has made a display of 3,000 yellow-painted shoes, jamming them in big swaths into a chain link fence. The shoes are a way to highlight a campaign they call “Road Scholar” aimed at smarter and safer pedestrian and bicyclist behavior. 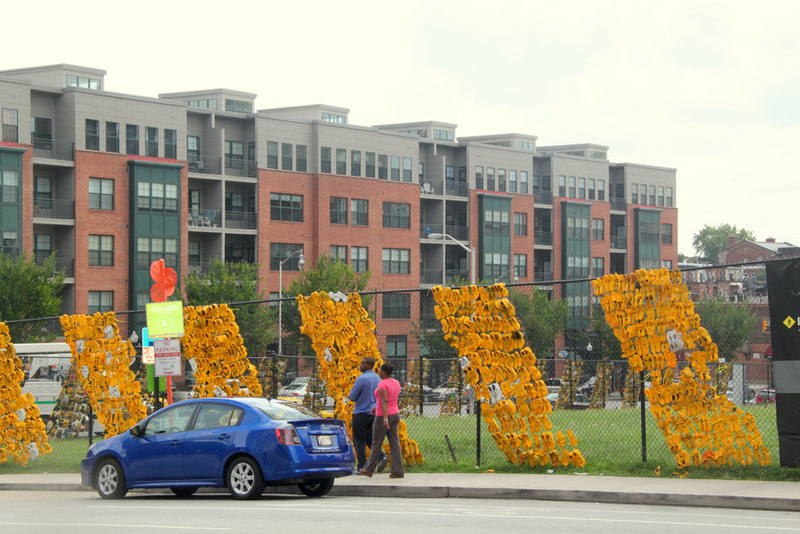 The 3,000 shoes (obtained from donations and from Goodwill Industries) represent the roughly 3,000 people in Maryland hit by vehicles every year, including more than 100 who are killed in these crashes. “Without making any conclusions about this particular case – which the police are still investigating – yes, this is a reminder that pedestrian safety is a really important issue for the Hopkins community,” said Hopkins spokesman Dennis O’Shea. 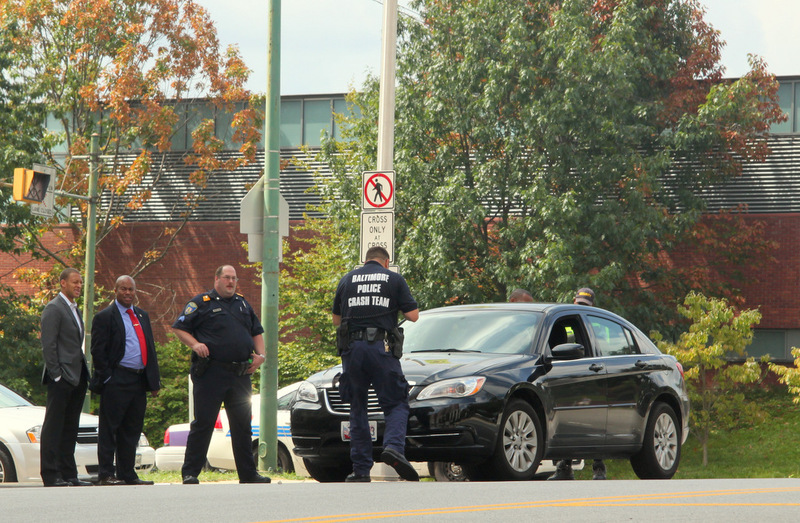 According to O’Shea, the injured pedestrian was a visiting student who “was attempting to cross at Charles St. and was struck by a car, that was north-bound on Charles St., turning right onto 33rd.” Police said the call about the incident came in at 11:45 a.m. The student was treated at the scene for thigh abrasions, he said. “We’re just glad the injuries weren’t more serious,” O’Shea said. He noted that there have been a number of cases in recent years of serious collisions claiming the lives of Hopkins students on foot and bike, including the fatal crashes involving Miriam Frankl in 2009 and Nathan Krasnopoler in 2011. The Road Scholar campaign is a public education initiative aimed primarily at getting students to pay attention, stop texting and take out their earbuds when they’re walking or bike riding. But what about the drivers of vehicles? University officials said they’re trying to “improve enforcement and roadway signage” around the Homewood and East Baltimore campuses. They also point to the $25 million city project to rebuild Charles Street from 29th Street to University Pkwy., a road reconfiguration intended to calm traffic. Yesterday’s incident wasn’t even the first of the year for the university. Another pedestrian, a Peabody Institute student vocalist from Korea, was struck by a vehicle on Aug. 29th at about 5 p.m. on Centre St., between Charles and St. Paul streets. “This was a case where a student was a little too eager to cross in the middle of the block, crossed into traffic and basically had her foot and ankle run over,” said Richard Selden, director of marketing and communications. The student’s injuries required surgery at Johns Hopkins Hospital, where she remains and is still recovering, Selden said.